Or as the Italians say, “Piove, governo ladro!” And it has rained a lot recently. The scale of the disaster  is indeed impressive: four people died, over 5,000 houses evacuated, 625,000 homes without power, the railway network decimated in parts of the country. Water is ruining thousands of hectares of farmland, and many hundreds of firefighters, police officers and soldiers have been deployed to rescue people, build walls of sandbags and inspect battered flood defences. According to the Met Office Britain experienced the worst January since records began and some parts of the country have seen twice their average rainfall. To make matters worse, the month was also one of the windiest since January 1993: a series of violent storms wreaked havoc along the coastline in Somerset, Dorset and Cornwall. At the centre of the official response to this chaos was the UK’s Environment Agency  (EA): a large quasi-autonomous non-governmental organisation with a staff of 11,200 and an annual budget of £1.2bn. It is in charge of several regulatory tasks, among them flood warning and flood protection activities. Unsurprisingly politicians and experts quickly began pointing fingers – mostly at each other. Thus the Environment Agency was intensively criticized  by several politicians and the news media over the floods ravaging southern England in the last weeks. Communities Secretary Eric Pickles said the government made a mistake  in taking the advice of the EA on flooding prevention measures. And yet interestingly, Prime Minister David Cameron still defends  the EA and cautiously supports Lord Smith, the agency’s chairman. This is odd, since as a former Labour cabinet minster he could be an easy scapegoat. So what’s going on? To begin with we must back-track a little. Independent agencies like these – dubbed quangos  – exist to perform some key functions for governments. They can gather the talent and expertise needed to form and implement tricky parts of public policy, and thus save (rationally ignorant) government ministers from having to do so. In areas where politicians might be wont to intervene – such as monetary policy or financial regulation – they can underscore a credible commitment to a policy of stability to market actors. Finally, and most relevant for this discussion, they can also function as a useful means of shifting blame for unpopular policies or actions: a “don’t-blame-me-it-was-the-independent-regulator-who-said-we-should-do-this” defence. But this move works best ex ante, not ex post. A government can hand over the regulation of energy prices or mergers to an independent body and laud this as ‘a good thing’; but that agency’s success, and thus that of the entire approach of de-politicising, hangs on the agency’s de facto independence  from government. So back to Cameron. There are three things to grasp here. Firstly, perhaps Mr. Cameron is wary of criticising the agency too harshly as it has been the victim of the austerity measures pushed through by his own government. Its budget has been cut  by 28% and 1,500 jobs are threatened (although these redundancies are now under review). 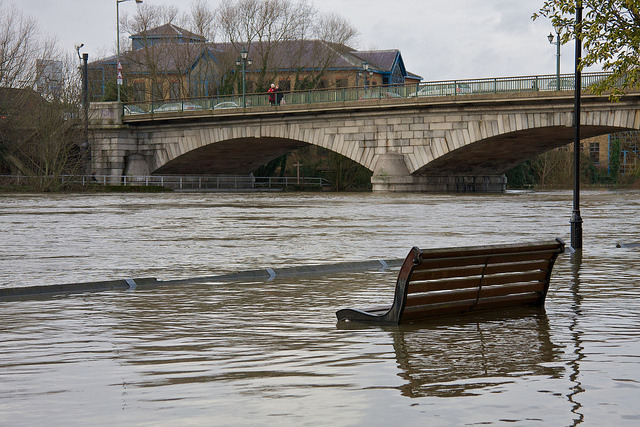 Equally significant have been the stringent constraints placed on the EA’s investment in flood defences by the Treasury, which demands high benefit-to-cost ratio and dramatically limit  the room for manoeuvre of the agency. As is now so obvious, these short-term  savings come at the expense of an exponential extra spending after the flooding – for disaster recovery, repairing damaged defences and investing in new infrastructure. Public censure of the agency the Prime Minister would simply hand ammunition to the opponents of the cuts. Thirdly, Mr. Cameron obviously cares about his reputation and is certainly aware that catastrophe mismanagement can be for him as electorally damaging as it was for US President George W. Bush in the aftermath of the Hurricane Katrina  in 2005. In this context, blame avoidance  is an incredibly subtle game. Any intervention in the EA’s operations, such as the removal of the agency’s head, would be interpreted as a signal of the undermining of this independence of from the government. It is precisely this perceived independence that allows the government to shift the blame for unpopular decisions to an arm’s length organizations to which regulatory power has been delegated. Firing the head and undermining this independence does away with the long-term strategy of careful blame shifting. It is better in the long run to have an agency that continues to enjoy independence than to meddle in an area of delegated policy-making and become entangled in an unedifying partisan spat. Mr. Cameron appreciates this, and so is quietly backing Lord Smith. Martino Maggetti  is a lecturer at the Department of Political Science, University of Zurich, Switzerland. He is co-directing the project “The Democratic Accountability of Transnational Private Governance”, funded by the Swiss National Science Foundation (with Fabrizio Gilardi and Yannis Papadopoulos). His latest books are Regulation in Practice (ECPR Press 2012) and Designing Research in the Social Sciences (Sage 2012, with Fabrizio Gilardi and Claudio M. Radaelli).